CBI - China: Day 29 of 154 of the Japanese Invasion of Manchuria. Spain: Day 92 of 985 of the Spanish Civil War. Spain: Day 457 of 985 of the Spanish Civil War. CBI - China: Day 102 of 2,987 of the 2nd Sino-Japanese War. Day 65 of 106 of the 2nd Battle of Shanghai. Day 46 of 70 of the Battle of Taiyuan. Spain: Day 822 of 985 of the Spanish Civil War. CBI - China: Day 467 of 2,987 of the 2nd Sino-Japanese War. Day 128 of 139 of the Battle of Wuhan. Day 5 of 81 of Japan's Operation GUANGDONG. ETO - UK: Germany's first air raid on the UK as bombers attack at the Rosyth dockyards in Scotland, damaging British cruisers HMS SOUTHAMPTON and HMS EDINBURGH and the destroyer HMS MOHAWK. CBI - China: Day 832 of 2,987 of the 2nd Sino-Japanese War. Atlantic: Seven German U-boats attack an Allied convoy from Nova Scotia bound for Liverpool. Over the next three days, 20 of the 35 the ships will be sunk, becoming the worst days of shipping losses in the entire Atlantic campaign. The slow convoy SC-7 left Sydney, Nova Scotia, on 05 Oct 40 bound for Liverpool and other British ports. The convoy included Greek, Swedish, Norwegian and Dutch vessels as well as British ships. 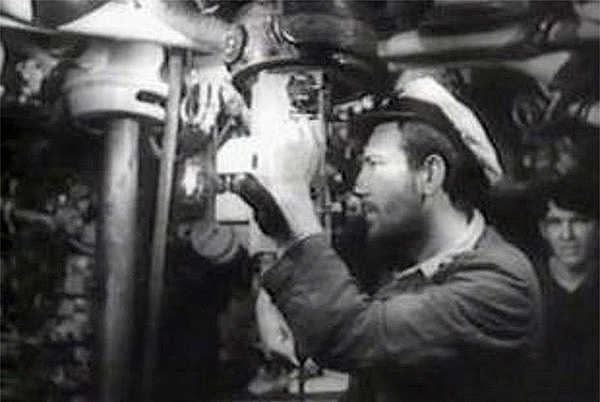 The disastrous outcome of the convoy demonstrated the German submarines' potential of being able to work more efficiently using wolf pack tactics and the inadequacy of British anti-submarine tactics at the time. Until the advent of reliable radar and longer range bomber protection, Germany's U-boat tactics will continue to be brutally effective. Atlantic: German U-124 torpedoes and sinks the merchant ship TREVISA south of Iceland, 7 are killed. ETO - UK: Day 41 of 258 of the Blitz. ETO - UK: Day 99 of 114 of the Battle of Britain. East Africa: Day 129 of 537 of Italy's East African campaign in the lands south of Egypt. CBI - China: Day 1,198 of 2,987 of the 2nd Sino-Japanese War. Day 337 of 381 of the Battle of South Guangxi. CBI - Thailand: Day 16 of 221 of the Franco-Thai War (Vichy France vs Thailand). Russian Front - Finland: Day 110 of 142 of Operation SILVER FOX, a joint German-Finnish campaign to capture the Russian port of Murmansk in the Arctic. Russian Front - Finland: Day 108 of 140 of Operation ARCTIC FOX, a joint German-Finnish campaign against Soviet Northern Front defenses at Salla, Finland. Russian Front - Finland: Day 117 of 164 of the Battle of Hanko. The Soviets will be forced off their leased naval base. Russian Front: Day 117 of 167 of Germany's Operation BARBAROSSA. Russian Front - North: Day 39 of 872 of the Siege of Leningrad. Russian Front - Center: Day 15 of 98 of the Battle of Moscow. Russian Front - South: Day 70 of 70 of the Siege of Odessa, Ukraine. Odessa falls to the Romanians after a Soviet evacuation by sea. During the two month siege, the Romanians have suffered 98,000 casualties. MTO - Libya: Day 190 of 256 of the Siege of Tobruk. East Africa: Day 494 of 537 of Italy's East African campaign in the lands south of Egypt. CBI - China: Day 1,563 of 2,987 of the 2nd Sino-Japanese War. Russian Front - North: Day 404 of 872 of the Siege of Leningrad. Russian Front - North: Day 165 of 658 of the Siege of the Kholm Pocket, USSR lays siege to the Kholm Pocket but the Germans hold out for a about a year and a half. Russian Front - South: Day 111 of 150 of Germany's CASE BLUE, the failed offensive to take the Caucasus oil fields. Russian Front - South: Day 55 of 165 of the Battle of Stalingrad, bloodiest battle in human history. MTO - Libya: US B-24s bomb shipping in Benghazi harbor. East Africa: Day 165 of 186 of the Battle of Madagascar. CBI - China: Day 1,928 of 2,987 of the 2nd Sino-Japanese War. PTO - Alaska: Day 132 of 435 of the Battle of Kiska, Aleutian Islands. The US and Canada will defeat the Japanese invaders. PTO - Malaya: Day 240 of 357 of the Battle of Timor Island, a long guerrilla war ending in Japanese victory. PTO - New Guinea: Day 88 of 119 of the Battle of the Kokoda Track. The Japanese are forced back by Australians at Templeton Crossing. PTO - Solomon Islands: Day 71 of 187 of the Battle of Guadalcanal. The Japanese continue shelling Henderson Airfield. Russian Front - North: Day 769 of 872 of the Siege of Leningrad. Russian Front - North: Day 530 of 658 of the Siege of the Kholm Pocket. USSR lays siege to the Kholm Pocket but the Germans hold out for a about a year and a half. Russian Front - South: Day 54 of 122 of the Battle of the Lower Dnieper River, USSR. Russian Front - South: Day 1 of 4 of a Soviet attempt to breakout from the Bukrin Bridgehead south of Kiev. MTO -Italy: Jews in Rome are rounded up, over 1,000 of them sent to Auschwitz. MTO -Italy: US 12th Air Force B-25s bomb targets near Bologna in support of US 5th Army. MTO - Greece: US 12th Air Force P-38s bomb a vessel in Leukas Channel off the west coast of Greece. CBI - China: Day 2,293 of 2,987 of the 2nd Sino-Japanese War. PTO - New Guinea: Day 28 of 219 of the Battle of Shaggy Ridge. PTO - New Guinea: Day 25 of 162 of the Battle of the Huon Peninsula. Will result in an Allied victory. ETO - France: Day 77 of 284 of the Battle of Brittany. ETO - Belgium: Day 45 of 62 of the liberation of Belgium. ETO - Belgium: Day 15 of 38 of the Battle of the Scheldt Estuary. ETO - France: Day 32 of 236 of the Siege of Dunkirk. ETO - Germany: Day 28 of 145 of the Battle of Hürtgen Forest. US 1st Army surrounds Aachen, Germany. Russian Front - Finland: Day 32 of 223 of the Lapland War. Finland and Russia have joined forces to kick the Germans out of Finland's most northern province. Russian Front - Finland: Day 10 of 23 of the Petsamo-Kirkenes Offensive. The Soviets will drive the Germans out of the Arctic region in northern Scandinavia. Soviets begin heading to Norway. Russian Front - North: Day 33 of 41 of the Battle of Riga, Latvia. Russian Front - Center: Day 2 of 206 of the Battle of the Courland Pocket in Latvia. Germans will hold this area until the very end of the war. Russian Front - Center: Day 12 of 18 of the Battle of Memel, a border town of Lithuania and East Prussia. The Germans continue to hold the Niemen line to cover East Prussia. Russian Front - Center: Day 33 of 72 of the Battle into East Prussia and northern Poland. Russian Front - Center: Day 1 of 15 of the Battle of Goldap, East Prussia. The Soviets enter German territory near Goldap. Thousands of German civilians flee the area in panic. Russian Front - South: Day 11 of 24 of the Battle of Debrecen, Hungary. Russian Front - South: Day 33 of 72 of the Battle of Belgrade, Yugoslavia. MTO - Italy: US 12th Air Force A-20s and fighters hit targets in the vicinity of Monte Belmonte. MTO: US 15th Air Force: B-17s and B-24s bomb in Austria and Czechoslovakia. CBI - Burma: Day 199 of 302 of the Chinese Salween Offensive in Burma. The British and Chinese begin an offensive from Myitkyina to Bhamo in northern Burma. CBI - China: Day 2,659 of 2,987 of the 2nd Sino-Japanese War. Day 183 of 259 of Japan's Operation ICHI-GO. PTO - New Guinea: Day 307 of 597 of the Battle of New Britain. PTO - New Guinea: Day 178 of 481 of the Battle of Western New Guinea. PTO - Palau Islands: Day 32 of 74 of the Battle of Peleliu (Operation STALEMATE II). PTO - Palau Islands: Day 30 of 36 of the Battle of Angaur. PTO Philippines: US Rangers land on islands in an approach to Leyte Gulf.